Gone are the days when kayaking used to be only for adrenaline junkies or an action sports fan. In recent years, more and more people have become aware of their passion and love for the great outdoors, and what best place to see and visit on open water than bone crushing water currents of monstrous rivers and insane rapids to see the true beauty of nature. Kayak fishing has also taken off in the past few years as it allows nature lovers to navigate too far away and hard to reach fishing spots out in the deep pockets of water. 1. Colorado River is in the first place. This almost legendary river passes through three states with dozens of some of the best kayaking spots you are ever to come across. The river is 297 miles long and has some of the best fishing spots you will ever find. 2. Juniper Run is one of the most picturesque spots in Ocala National Forest, Florida. The forest itself is about 607-square-miles big, and juniper run has been in the top 20 canoeing spots in the US for a while. And for a good reason as well. It is stunning and transports you into another era. 3. 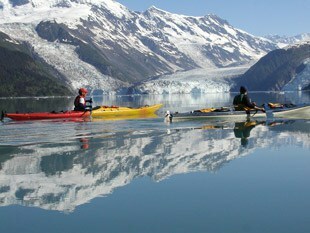 Prince William Sound in the Chugach National Forest, Alaska is surrounded by towering glaciers, and you will be closest to Mother Nature when you’re out there paddling with Orcas in the vast quiet waters. It is a great place to go if you are trying to just get away from all the hustle-bustle of the big cities. 4. Gauley River is located in West Virginia, and just after summer is over in September and October, the waterways are fierce and perfect if you’re looking for a challenge. 5. Devils River is a Texas river and is famed as one of the best kayak fishing spots because of the almost heavenly fresh fish found out there in and after spring. 6. Lake Guntersville is in Alabama is more of a complete outdoors experience with camping rather just a kayaking spot. 7. Arkansas River is the sixth longest river in the US and has everything from class II to IV rapids that will get your blood pumping. It is surrounded by the 140-foot Rockies on both sides as you go down the Royal Gorge. Now that we have the best spots out of the way let’s take a look at the best kayaks as well. 1. Ocean kayak is one of the top kayak brands, and they have the tandem kayak which is for couples and families with space for two adults and a child or a dog to tag along with you on your adventures. Their Malibu and Zest TWO kayaks are some of the best in the business. 2. The Intex Explorer series are all top notch with K1 variants being for a single person and K2 for two. 3. Malibu Kayaks Stealth 14 is the best choice if you plan to do some fishing while you’re out exploring.